Clorox brand SOS Scrubbers and Sponges are world famous in restaurant kitchens nationwide. 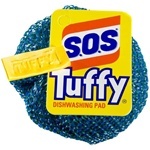 SOS scouring pads remove baked on food and junk off of your dishes. S.O.S. sponges are heavy duty and last through hundreds of cleaning jobs night after night.